Lately I've been keen to channel my inner milkmaid, for which my kitchen (and my curves) are well equipped. Having truly enjoyed the experience of making fresh ricotta, I decided to try making homemade mascarpone cheese. 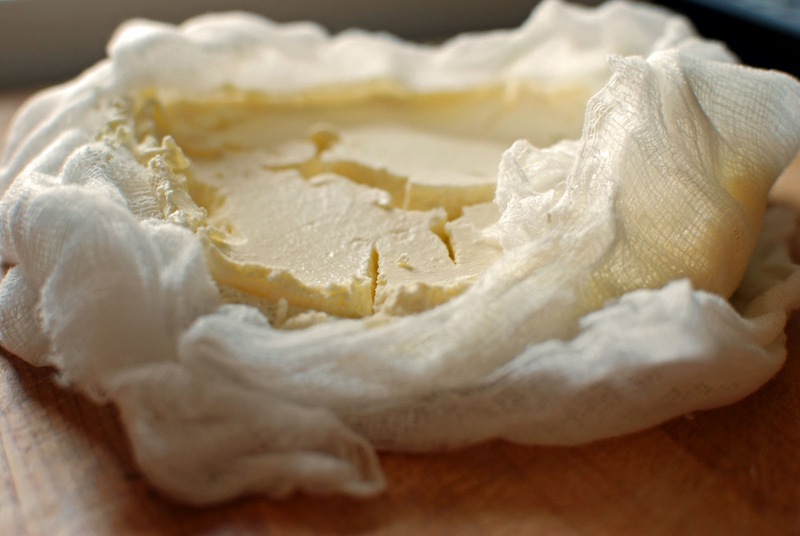 Mascarpone is the naughtier, creamier cousin to ricotta. Where ricotta is the cheese you'd introduce to your parents, mascarpone is the cheese you'd cheat on ricotta with. It's a rich, smooth, spreadable cheese with a light flavour that is best known for its longstanding affair with the beloved Italian dessert - tiramisu. As much as I enjoy anything creamy and coffee-flavoured, I wanted to prepare something fresh to accompany this season's local strawberries. I decided to introduce yet another tart to my imaginary patisserie. 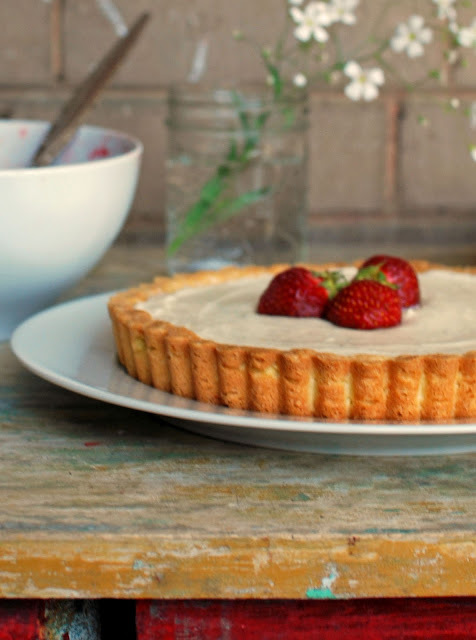 This tart has an almond crust, filled with the creamy combination of fresh homemade mascarpone, cream cheese and sour cream, speckled with flecks of vanilla bean and lemon zest. 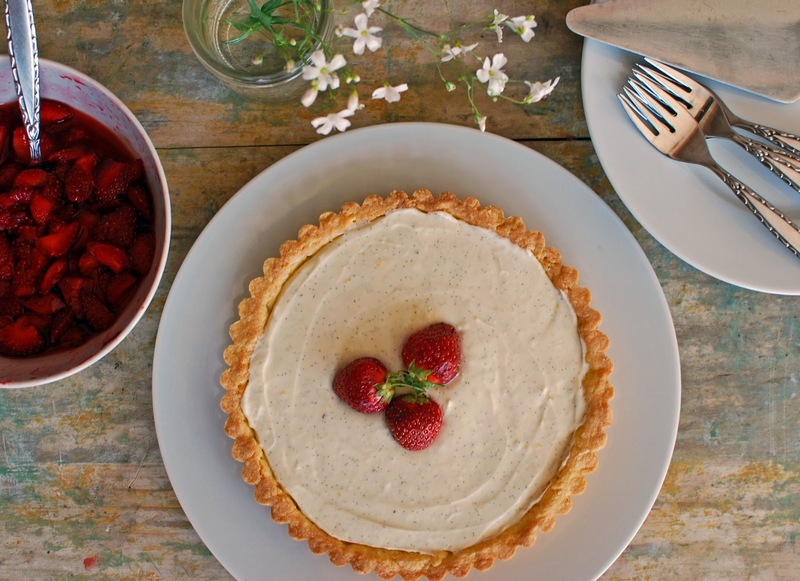 The tart is topped with macerated strawberries, which taste best au naturel with just the finest sprinkling of sugar to get their juices flowing. I discovered that online, everyone and their Italian neighbour has an opinion on how to make homemade mascarpone. There are those who insist the cream skimmed off the milk used for Parmesan cheese is the only cream worthy of mascarpone. Others scoff at using lemon juice as the acidic component. I have never seen so many words about curds when scouring comment sections. I decided to try the technique that was most consistently referenced, with only a slight variation - and great success. Two cups of organic whipping cream are brought to 190F in a heavy-bottomed pot, which is stirred occasionally to avoid scorching. One tablespoon of organic lemon juice is added. The mixture is stirred at a consistent temperature of 190F for an additional 5 minutes, or until it thickens slightly and coats the back of the spoon. It is then poured into a strainer lined with 4 layers of cheesecloth set atop a bowl to catch the whey. The bowl and the strainer are then covered and set in the fridge to thicken overnight. What is left the next day is a beautiful, rich mistress of a cheese. For the tart base, I chose an almond pâte sablée, which makes for a lovely sandy texture. The base is baked to a beautiful golden brown, fully cooled, and then filled with a refreshing mixture of the mascarpone, cream cheese, sour cream, lemon zest and vanilla bean. While the tart sets in the refrigerator, fresh and local strawberries are sliced and macerated with a bit of vanilla sugar and a twist of freshly ground pepper (it really helps bring out the flavour!). The fresh and tangy mascarpone filling plays off the sweetness of the berries and the sweet almond-y crumb of the crust perfectly. To serve, the tart is lovingly adorned with a heaping spoonful of strawberries drunk on their own sweet juices. I suggest you schedule a rendezvous with this dessert - just make sure ricotta doesn't find out. Heat cream in a heavy-bottomed saucepan until a candy thermometer reads 190F, stirring occasionally to avoid scorching the bottom. At 190F, add lemon juice and stir constantly for an additional 5 minutes, or until mixture coats the back of your spoon. Allow mixture to come to room temperature (about 40 minutes) and place in strainer lined with 4 layers of cheesecloth over a bowl to catch the whey. Cover with plastic wrap and allow mixture to strain in fridge overnight. In a stand mixer fitted with the paddle attachment, cream butter and confectioner's sugar until light and fluffy. Push hard-boiled egg yolk through a sieve into a small bowl. Add raw egg yolk and vanilla and combine. Add to butter/sugar mixture and mix until incorporated. Add flour, ground almonds and salt and mix until the flour is evenly moistened. Place a sheet of plastic wrap on your countertop and empty dough onto it. Using the corners of the wrap, bring dough together into a ball, and flatten into a disc. Refrigerate for four hours or up to four days (may also be frozen). Before rolling the dough, allow it to come to temperature for about 15 minutes. Place disc of dough between two sheets of parchment paper and roll out from the centre, rotating the dough 30 degrees to achieve an even thickness of about 1/4". Carefully drape the dough across your tart pan (this recipe makes enough for an 8-10" tart pan). Use your rolling pin across the top of the tart pan to remove excess dough. Dock the bottom and sides of the dough with a fork and bake at 325F for 20 minutes, or until light golden brown. Allow to cool completely before filling. In a stand mixer fitted with the paddle attachment, whip cream cheese until fluffy. Add sour cream, sugar and honey and combine. Add mascarpone, lemon zest, and the seeds scraped from the vanilla bean (keep the pods to perfume your sugar). Combine, refrigerating until ready to use. Slice strawberries into a bowl. Using your hand, carefully take a handful or two of the sliced strawberries and squeeze them. 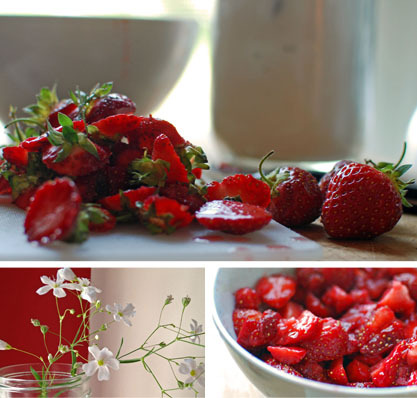 Sprinkle strawberries with sugar and a few twists of freshly ground pepper, to bring out the flavour. Let sit at room temperature for 1/2 hour before serving, or refrigerating. To assemble, fill tart base with mascarpone mixture, using a spatula to even out the top. Refrigerate for 4 hours for filling to firm up. 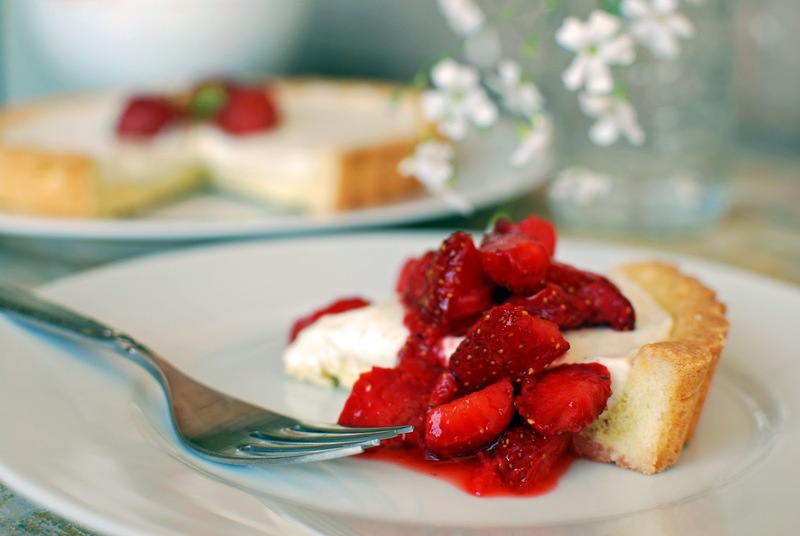 To serve, slice tart and top with a heaping spoonful of macerated strawberries. Enjoy! These look so gorgeous! Any dessert with mascarpone in it immediately becomes one of my vices. Combine that with mascerated strawberries and you've created a monster of me. Sometimes I mascerate strawberries just so I can drink the juice left in the bottom of the bowl after the berries are gone. Thanks Kristin! Yes, when I stumbled upon your blog - I think it was through Pinterest, I thought "Pastry Affair" hmmm...that blog by name alone sounds pretty sweet, and rather in tune with how I think about food (as you can see by my blog name) and I was so happy to click on the link and be met with delicious recipes and photos that left me inspired - like your mascarpone recipe! Thanks for that - it turned out beautifully. Another great one. I will have to try the homemade mascarpone and ricotta. I have done a fair amount of fresh chevre... also easy.. How about this tart with chevre..hmmm. I love the tart and I love your table top, too!